His continuing work with action pictures of human and animal locomotion eventually led to his invention of the "zoopraxiscope," a moving picture machine that showed a rapid succession of images. The above images are an animation of a series of his photographs to simulate a continous picture. UR EYES are one of the five specialized ways our mind uses to form a picture of world. The eye is a remarkable instrument that has certain characteristics that help us to process the light we see in such a way that our minds can create meaning from it. The motion picture, the scanning of an image for television, and the sequential reproduction of the flickering visual images they produce, work in part, because of an optical phenomena called the persistence of vision and its psychological partner, the phi phenomenon—the mental bridge that the mind forms to conceptually complete the gaps between the frames or pictures. 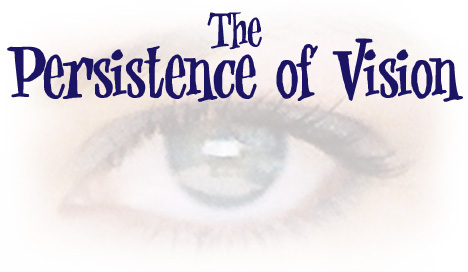 Persistence of vision also plays a role in keeping the world from going pitch black every time we blink our eyes. Whenever light strikes the retina, the brain retains the impression of that light for about a tenth of a second—depending on the brightness of the image—after the source of that light is removed from the eye. This is due to a prolonged chemical reaction. As a result, the eye cannot clearly distinguish fast changes in light that occur faster than this retention period. The changes either go unnoticed or they appear to be one continuous picture to the human observer. This fundamental fact of the way we see has been used to our advantage. When we go to the movies, we know that a motion picture creates an illusion of a constantly lit screen by flashing separate, individual photographs in rapid succession. Even though the movie screen appears to be constantly lit, it is in fact dark about half the time. This flickering image on the screen gave rise to the old term “flicks” in the early days of movies. Today’s motion pictures flash a picture on the screen at flicker-free 24 frames per second. Television too, uses a complicated form of intermittent light impulses to literally build the picture we see. If a picture can be built up in less than a tenth of a second, the eye will be unaware that this process is even occurring. In fact, it will and does appear as if the picture is constantly lit all the time. Simply put, if you could create at least ten pictures per second, you could maintain the illusion of a continuous image or picture. You may remember the little “flipbooks” you might have made as a kid that worked on this same principle. The more images per second the smoother the picture looks. American television actually transmits and recreates 30 complete pictures per second to give the illusion of a single continuous picture. Errant assumptions lie at the root of every failure. The real voyage of discovery consists not in seeking new lanscapes but in having new eyes. Nothing is as frightening as ignorance in action. The way out is through the door. Why is it that no one will use this exit? Biologists tells us that the eye does not function to replicate the world we come into contact with, but instead to sense, process and encode the motion, patterns and colors of the light we see into something our minds will interpret. Our minds interpret the data given to us by our eyes in connection with all of the other organs that respond to our environment. It combines this new data with similar information it has already stored in our memories. As a result, no two people see anything exactly alike. Now the default setting that our mind comes with, operates in much the same way. We develop patterns of thought or mental models that shape what we “see” or “perceive” and thus what we think and how we will chose to think about new information that comes our way. We persist in or hold on to thinking that connects with the mental pictures or mental models we have already formed in our mind. So as we go from scene to scene in our lives, our mind fills in the gaps between our experiences with the same old familiar thinking. It connects our thoughts and experiences in such as way as to keep them as consistent and uniform as possible with what we already think. Call it a persistence of thought. We see what makes sense to us. We form a picture of ourselves and develop beliefs and opinions around what is consistent with what is already there in our heads. Anything that is inconsistent with that image or contrary to our current ideas or thinking, seems to go unnoticed or is consciously ignored, so that we may maintain that continuous, uninterrupted picture of our world. Just as what we see is governed by what we think, so what we perceive as real—our feelings, thoughts and assumptions—is based on what we think is real. It sounds obvious but it has far-reaching, often overlooked, implications. Our mind is constantly trying to make sense of our world. We pull in dissimilar information and our mind tries to connect it with what we already know. To facilitate this process, we create mental models that filter everything we experience. International consultant and author Luc de Brabandere reminds us in his book The Forgotten Half of Change, “It is not a question of intelligence, but rather one of our perception of the world around us.... We see and hear things in a variable way, and certainly differently from one another, because only the hardware is common to all of us. We can even become blind or deaf when confronted with some situations that will be glaringly or blaringly evident to others. It is therefore hardly surprising that, from time to time, we do get stuck.” Stuck in the same old thinking. The mental gymnastics that our mind goes through can stabilize us, but it can also leave us out-of-sync, chasing dragons and acting on what doesn’t really exist or isn’t even true. We can often find ourselves reacting to people and situations in ways that are inappropriate, as our reality is skewed. It can cause us to be rigid, un-teachable thus impeding our growth. This is especially true when something is discussed or brought to our attention that doesn’t fit in with what we want, or how we want to live or explain our lives, or more importantly how we think about or see ourselves. U.S. Supreme Court justice Benjamin Cardozo, renowned for his integrity and elegant opinions once remarked, “In the life of the mind as in life elsewhere, there is a tendency toward the reproduction of kind.” In other words, we like to keep on thinking the same kinds of things that we always have thought, and this is nowhere more apparent than in the things we think about ourselves. We are predisposed to think things about ourselves that make us feel good and that keep all our thoughts connected and flowing together smoothly. We often surround ourselves with and get feedback from friends that think like we do and that will reinforce our view of ourselves. We generally don’t like thoughts or a world around us that makes waves, especially when it affects our self-image. This tendency can protect us but it can also limit us when it comes to growing and understanding more and taking in a bigger picture. We tend to view our problems too with the same lens or viewpoint that we always have. First century philosopher Epictetus observed that “it is not the things themselves which trouble us, but the opinions that we have about these things.” Much later Shakespeare echoed this thought by writing, “There is nothing either good or bad, but thinking makes it so.” Thinking about ourselves or seeing a situation in the wrong way can literally condemn us to relive the same life and situations over and over again. Our life won’t change until we change our thinking. What this means is what we think is all inside our head. We filter what we perceive. We see what we want to see and call it real or true. It is important to realize that what we think is actually shaped by what we already think. This should cause us to proceed with caution, but all too often we plunge ahead confident that we “know” what we think we know. We need to rethink our assumptions with some degree of humility. We need to ask ourselves if that which we think or perceive is so, is so because of what we have already programmed our minds to see. We need to wonder if the problems we see in others are getting through our filter because those problems are part of our own thinking. By and large we ignore reality in favor of the truth we create in our own heads. In Confronting Reality, authors Larry Bossidy and Ram Charan agree that generally we see the world as we want to see it. They write, “Avoiding reality is a basic and ubiquitous human tendency. [Most people] often do it unconsciously but also may do it knowingly; sometimes it seems, there’s just no choice.” It is so easy for us to get stuck and think of ourselves in the way we have always thought of ourselves. The problem is it skews reality by blocking out the truth we might otherwise be learning. So we create myths about ourselves. Because we don't see well—even when we've got perfect eyesight—our perception deforms things, foreshortens and fogs our view, leads us into errors. A little over forty years ago in June of 1962, President Kennedy spoke at Yale University in New Haven, Connecticut. The context of his speech was economics, but I think you will see his comments have application in other areas of our life as well. He said, "As every past generation has had to disenthrall itself from an inheritance of truisms and stereotypes, so in our own time we must move on from the reassuring repetition of stale phrases to a new, difficult, but essential confrontation with reality. "For the great enemy of truth is very often not the lie—deliberate, contrived and dishonest — but the myth — persistent, persuasive and unrealistic. Mythology distracts us everywhere." The myth is quite often more dangerous than the lie. The myths we create about ourselves can be more dangerous than the lies we tell about ourselves. The lies we can identify and we know they are there. They are deliberate. But the myths are persistent, reassuring and created automatically so that we deceive ourselves. Our own mythology distracts us from growth. Again, we become people who will not learn. We become un-teachable. We frequently think things don’t apply to us because we’ve already thought them through. However if we are growing, we should begin to find a deeper meaning to what we think we already know at the very least. Perhaps there is even room for improvement, we just don’t see it. So we need to rethink, to reframe, to go back over it again and again. To learn we need to unlearn. And to grow we must change the way we think about ourselves. Anaïs Nin, in a more lucid moment wrote, “We don't see things as they are, we see things as we are.” Emerson wrote, “People only see what they are prepared to see.” As we go through each day, our experiences and observations change us. So what we didn’t see yesterday we may see today, but only if we are consciously going over the old material in our heads and are challenging what we think about ourselves on a daily basis. Unless we make a conscious effort to break this cycle, this persistence of thought, we will continue to reproduce yesterday’s thinking. It is a self reinforcing cycle that gets us nowhere. Left alone, this mental inertia will cause us to miss the benefit of our experiences, our observations, and self study. Neither personal growth nor growth in our knowledge base isn’t logical and it isn’t automatic. It takes doing what we are not naturally inclined to do and it takes a lot of effort. Often getting out of our own way is the first step in the growth process. It is a healthy thing now and then to hang a question mark on the things you have long taken for granted. Significantly, that growth growth depends on the questions we ask about ourselves, not the answers we habitually get. Author Antony Jay revealed that, “The uncreative mind can spot wrong answers, but it takes a creative mind to spot wrong questions.” What's needed is a creative mind that can switch gears and see from a new perspective. We need better questions, not the same old answers. If we’re not growing and deepening our understanding, we’re not asking the right questions. Moving forward from a persistence of thought requires that we look at our thinking in a new light and then to reframe it. We should begin to challenge the way we think and as a result the way we act. New behavior will follow from a new way of thinking. To paraphrase President Kennedy, the time has come for us to move on from the reassuring repetition of stale thinking to a new, difficult, but essential confrontation with the reality of ourselves. Only then can we grow.